Liam’s quilt is done! And I’m so glad I asked for ideas for the binding. ‘Cause I had nothin’. I really took my time trying to picture them all, but in the end it was Janica’s suggestion of brown that got my wheels turning. I thought at first about a woodgrain print, and then found a light and mid-tone brown striped shirting at G Street Fabrics. I turned that into what felt like 463 yards of binding for use on the quilt and later on the bumper. 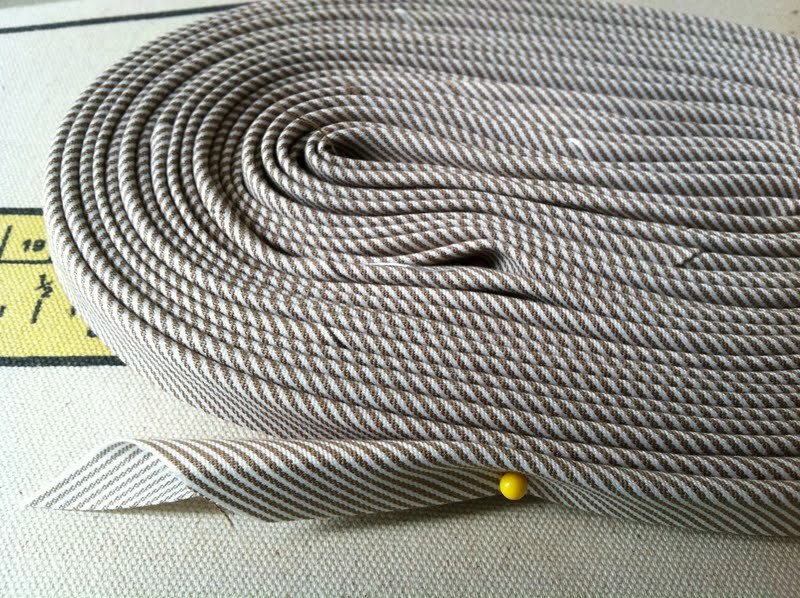 And here’s the binding at work! All quilted and bound! Liam’s parents have pretty classic taste, and I think the binding fabric choice worked well with the blue and white pinstripe fabric in the quilt. It’s slightly different from the linen, but not so different that your eye is drawn to it first. And not so similar that it’s a bore. Not a bore, but still a great place for a snooze? 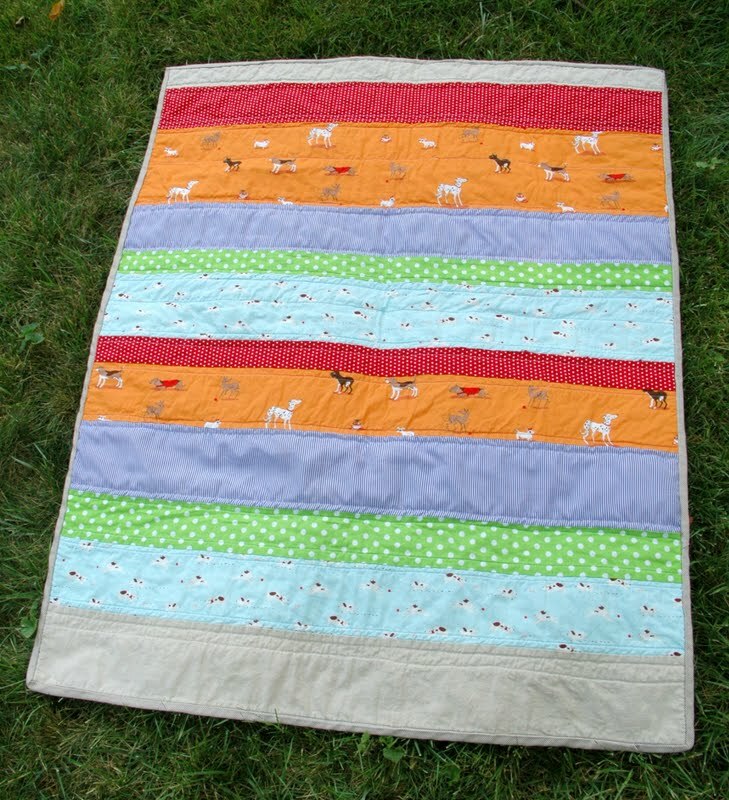 I really love straight-line quilting, and especially for a boy quilt. Here’s the back side. Mostly Kona White with three little dog houses and four little dogs. 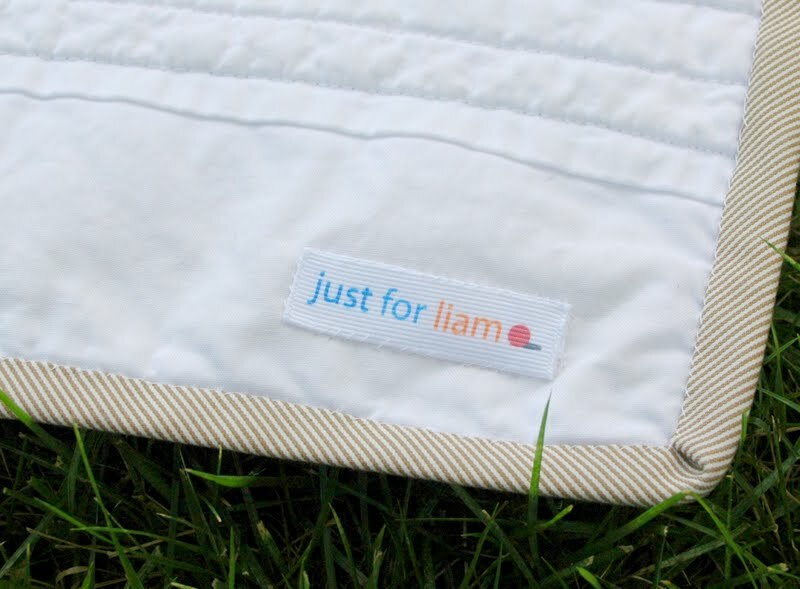 My favorite little finishing touch– hand-stitching a printed grosgrain label that says “Just for Liam” and a little red ball just like the ones in the two doggy prints. I’ve got more to tell you about these labels on Wednesday. There’s not much that I can say to follow a photo of Mr. Miracle. So I’ll just say I’ll see you back here Wednesday. Aaaaaah, I’ll never get tired of looking at that face. I love it, all of it!!! Aww, what a cute miniature. Love the quilt!! Love the quilt. You’ve done a fabulous job pairing the fabrics and the houses are just adorable. And I have to say that little faces makes me smile a mile wide. 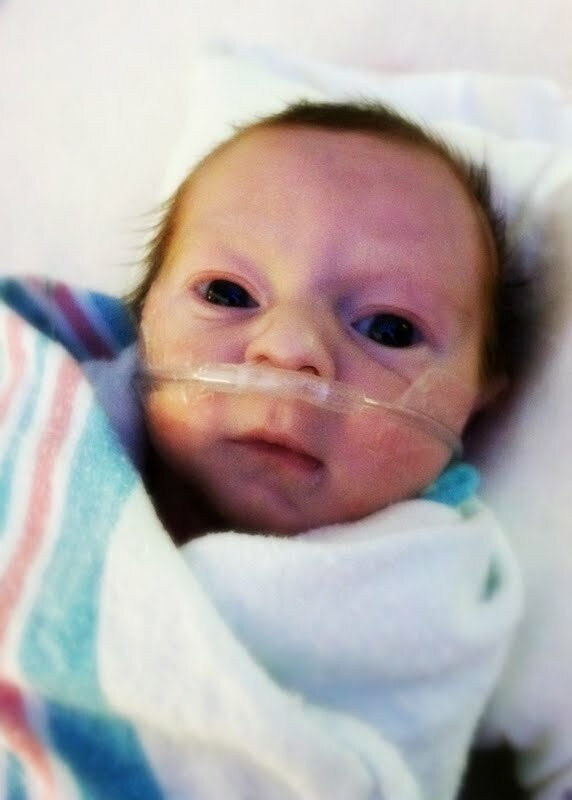 Trying to decide if it’s the cuteness factor of those wide eyes or the miracle of it all. I LOVE the quilt, and baby Liam looks so good and healthy! Beautiful job on the quilt! He is SO stinkin’ CUTE! And that hair! My son came out with lots of it–love it. So adorable and sucha precious miracle. 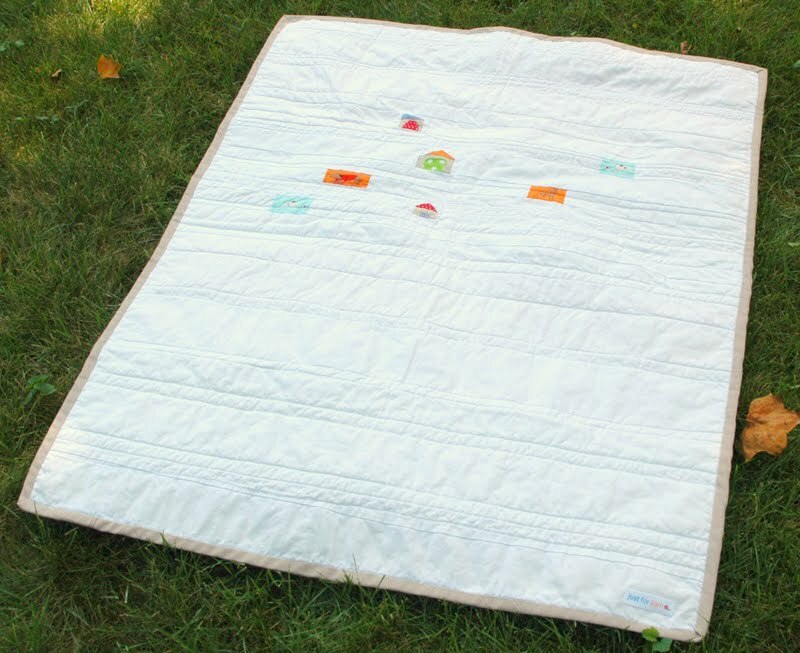 The quilt is beautiful, just like Liam! I’ve been praying for him. By the way, I’m jealous of all that hair. My daughter is almost 2 1/2 and she’s just now got enough hair for pigtails. Hmph. 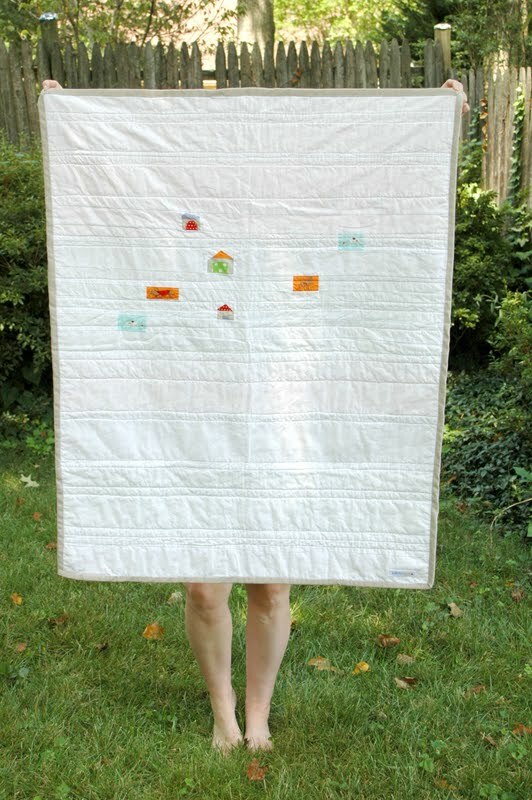 Love the quilt and that adorable baby!!!! He’s beautiful, and its exciting that he’s doing so well :). 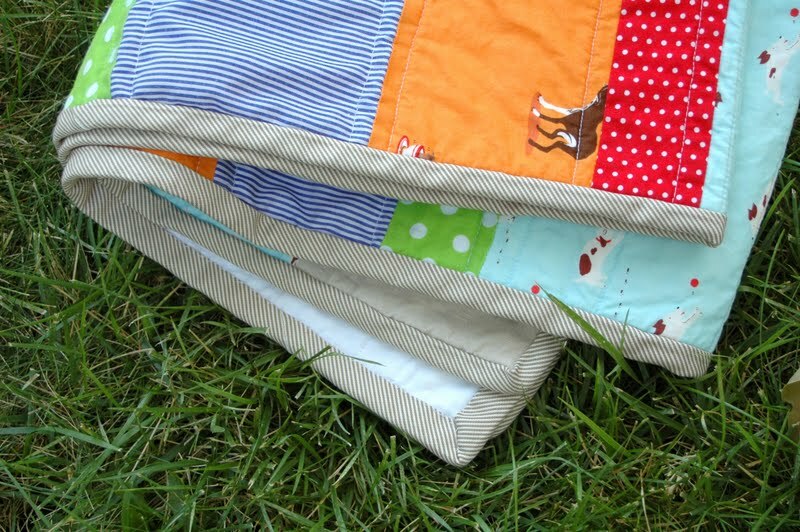 I also love the idea for a boy quilt. Thanks! ACK! What a fabulous quilt! I love everything about it. 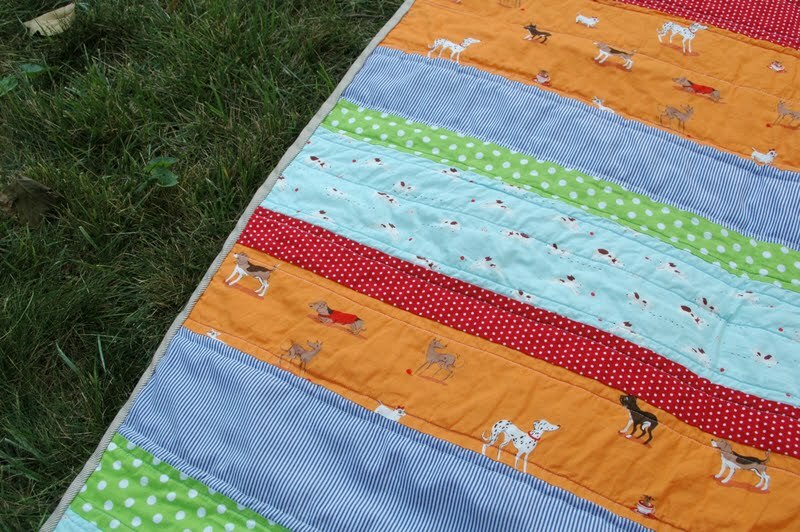 Again, you REALLY have an eye and a talent for quilting! But I must say… That adorable little baby is upstaging your skillz! Awesome! Thanks for the update and showing the lovely Quilt! And what a CUTIE PIE! 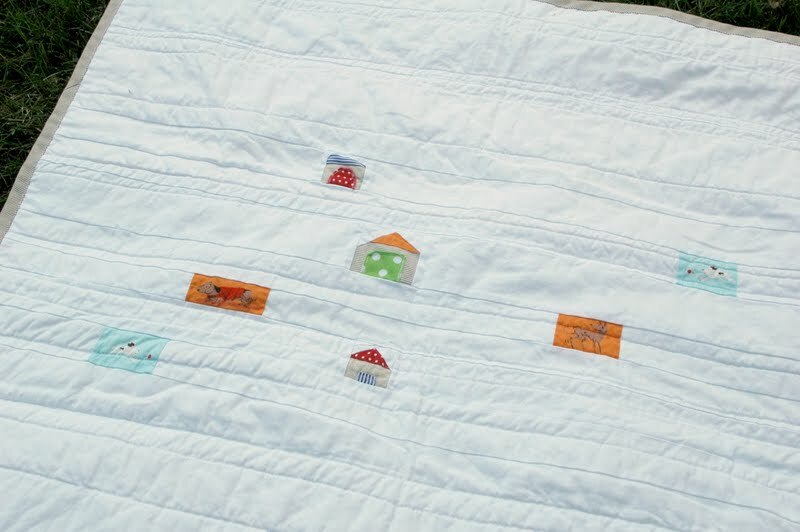 The quilt is very, very cute but that boy does steal the show! What a sweet baby. So very glad he gets stronger each day! mr. miracle is right! he is gorgeous and the quilt is a perfect match for him. well done! Can’t get over your use of the stripes on your bias! So simple, but so pretty! Also, how exciting to see a little premie getting stronger and stronger. I had a friend who had a premie about 6 months ago, and it makes you thankful for every little development. Welcome to the world Liam!